BetDSI is one of our sponsors and has provided us with a great deal. Our fans can get this great offer by using our BetDSI Promo Code. When you use one of our promo codes you are directly supporting our podcast and site. Thanks for your support. This is the maximum amount that can be awarded to new members. Where to enter your BetDSI Promo Code? 1) Click on the image below to go to the website. 2) Enter your personal details under the “Open Your Account” section. 3) Enter our exclusive promo code MMA100 in the “Promo Code” section. 4) Receive your discount deal for a $10 Free Play + 100% signup bonus up to $1000 and begin playing. BetDSI is one of the global leaders in betting and gambling services with a huge variety of sports to choose from along with horse betting, casino, bingo and Poker services. BetDSI is the best bookmaker sportsbook around. They have a wide variety of sports that you can bet on. NBA, College Basketball, Soccer, Tennis, Baseball, Hockey, MMA, Golf, Boxing, Motor Racing, Rugby, Cricket, Aussie Rules, E-Sports, Handball, Volleyball, and more. 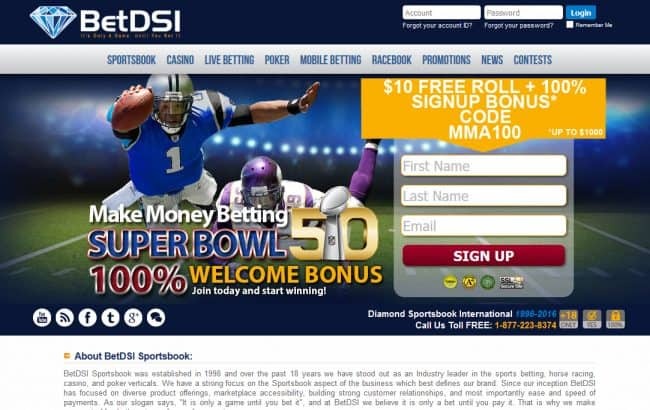 BetDSI is an established online sportsbook. They have been around since 1998. One of the most trusted bookmakers in the business. BetDSI is the best Casino Online. You can play 6 different kinds of Blackjack, 3 kinds of Roulette, and 13 types of Slot Machines. Plus 8 Video Poker options, Craps, Baccarat, Pai Gow Poker, Caribbean Stud Poker, Let It Ride, Three Card Poker, Bingo and Keno. Lots of games to play and win at. They also have virtual tournaments. You can also do mobile betting through BetDSI through your smart phone or tablet. This allows you to deposit money and bet on sports, online casino games, and horses. The mobile app can be downloaded from the BetDSI website. BetDSI is one of a few MMA Betting sites. You can bet on UFC events here. 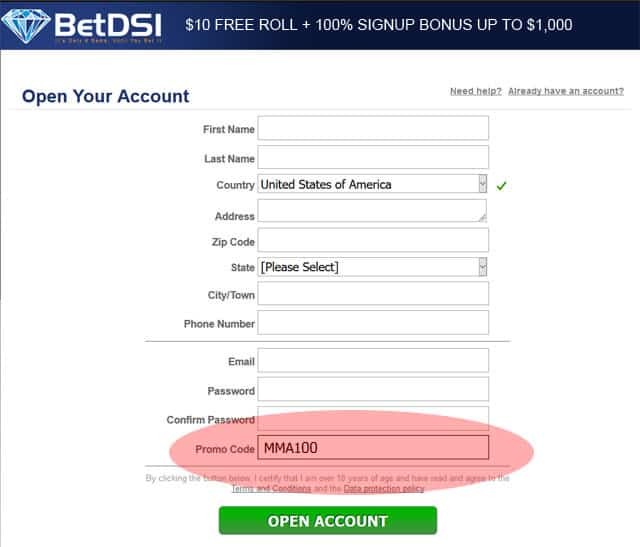 BetDSI accepts Bitcoin, Mastercard, Visa, Bitcoin, American Express, Neteller, eco, World Connect Express, BankDraft, Person to Person transactions, and Bank Wire.